Spray applying soft-touch coating to computer keyboard buttons. It seems that end users spanning across multiple industries just can’t keep their hands off soft touch. So much, in fact, that according to a study by Future Market Insights, “The global soft-touch polyurethane coatings market is expected to expand at a compound annual growth rate of 7.2 percent from 2015-2025.” So, what is so special about soft touch? Soft-touch materials have the ability to transform the sometimes uninviting feel of plastic into a comfortable rubber-, leather- or velvet-like sensation. It turns a hard, cold plastic part into a warm, inviting object that says, “grab me.” On top of that, it exhibits high scratch and abrasion resistance, and protects the plastic from chemicals that may cause deterioration or ugly yellowing due to exposure to a harsh environment. With its tough exterior and positive haptic effects, it still maintains a trendy low gloss, low reflectivity look. This allows manufacturers to take a relatively inexpensive material, such as plastic, and apply a coating to give it the appearance of a high-end luxury item. The ability to create a high-end appearance with lower cost materials is driving many industries to adopt soft-touch coatings. The automotive industry held 37 percent of the market share in 2014, using soft touch primarily to coat interior parts: steering wheels, front panels, door handles and trims, push buttons, air bag compartments and armrests. Similar applications are found in the aerospace industry on interior paneling of cockpits. Soft-touch coatings also are commonly found on consumer goods found in the kitchen, such as coffee machines, ovens, refrigerators and even the handles on pots and pans. In addition, as mobile and handheld electronics continue to become commonplace, the appearance, feel and protective qualities of soft touch have become the norm for their exteriors. It often is found on laptops, tablets, remote controls and mobile phone casings to make for a nicer feel that also protects the product from common drops and prevents it from sliding off the table. The scope of soft touch has even spread beyond durable goods into the consumer packaging industry, where it is applied to everything from cosmetic bottles to food canisters. This coating provides a high quality and even luxurious appearance to potential consumers. For this reason, many industries are turning to soft touch to differentiate their products from those of competitors. John Federjaka, the owner of FedCor Global, LLC, a hybrid manufacturing company dealing in the US and Asia, applies soft touch to nutrition canisters. According to Federjaka, “Soft-touch paint is a way for companies to differentiate their brand from others on the shelf because it gives a perception of quality. When two canisters are sitting on the shelf containing essentially the same thing for the same price, it becomes hard to differentiate the products. Oftentimes, customers are making the decision based on something as simple as, ‘this one feels like a higher quality product.’ ” This quality perception can make all the difference in a consumer’s buying decision. The soft-touch coating is a high solid, two-component polyurethane material. Currently, there are two options for the base of soft-touch paint. Traditionally, solvent has been used as the primary base for reduction. However, recent government regulations on volatile organic contents (VOC) and a surge of more environmentally conscious companies around the world have created market for water-based coatings. This trend is expected to take off in coming years and continue to take more of the market share as industry leaders begin to shift their focus toward more water-based material to keep up with environmental regulations and trends. 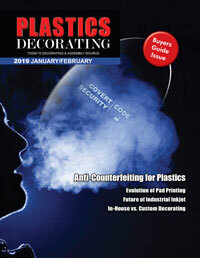 Manufacturers interested in implementing this coating should analyze their paint line capabilities. Soft touch is an application that can be easily implemented; however, there are a few things to know about the material before starting. The material itself is very thick, but often can be delivered from the supplier in a pre-reduced version to meet specifications. The level of reduction or solvent added will depend on the type of finish required. A highly reduced material will have a lower viscosity and be easier to spray but will have more solvent waste. A non-reduced material will be very thick, require a higher pressure to spray and result in less control over surface finish. Because the material resin is thick, the solids tend to settle at the bottom and clump together, requiring more effort to mix the material. This means that prior to starting the process the resin material will need to be mixed to ensure the materials are stirred off the bottom and then agitated throughout the finishing process. This will ensure a homogeneous mixture and consistent results. Soft-touch coatings are two-component materials requiring the mixture of a base and catalyst to create a chemical reaction that eventually cures and solidifies within a set timeframe. This is what produces the unique soft feel, yet with a tough, scratch-resistant surface. However, once the materials are mixed, the clock is ticking, and limited time is available to apply the material before it cures beyond acceptable spraying viscosity or fully solidifies. This timeframe is known as pot life or working life. Soft-touch coatings can have a relatively short pot life, which can be challenging in a production environment. In addition, if the material isn’t moving or being sprayed for an extended amount of time, it can start to gel in the hose and cause all sorts of problems with streaking or surface finish. When utilizing a batch mixing process, the short pot life can lead to the need for frequent mixing and flushing, smaller batch sizes, increased waste, increased labor, increased downtime and decreased productivity. Because of these issues, it is highly recommended to mix the catalyst and the resin on demand, using 2K proportion equipment, to save time, materials and costs while avoiding quality defects. Like most painting processes involving plastic, it is important to keep the surface clean before applying the coating. This can be completed in a number of ways, including solvent hand wiping, aqueous power washing, ionized air blow off and even CO2 snow cleaning. Some manufacturers also will use a flame treatment or atmospheric plasma operation to increase the surface adhesion of the part and improve its compatibility with the coatings. The application process is essentially the same, but due to the minor differences in the makeup of the material, considering a few points could increase quality and greatly improve overall production, resulting in fewer headaches for those applying the coating and higher satisfaction from end users. Most of the application equipment required for soft-touch materials is similar to that used for other finishing paints and coatings. Spray guns, pumps and agitators should all easily translate into soft-touch applications. But, due to the heavy nature of this material, it tends to sag if it isn’t sprayed with the right parameters for the desired finish. Before starting production with this new material, run a few tests to make sure the process parameters are right. Controlling parameters such as flow rate, spray gun air and pressure during the production process also will ensure desired consistency is met and maintained. Keep in mind, it will be harder to get a consistent spray pattern near the end of the pot life cycle. The need for correct ratio mixing and impact of the pot life can bring into question the mixing strategy. Once mixed, the soft-touch resin and the catalyst have a specific window before the material can no longer be sprayed. So, the biggest question to answer when looking to implement soft touch is, “What is the most efficient and effective way to mix?” Let’s take a look at the options for mixing. One option is to hand mix the resin and the catalyst. This option often is cheaper on the front end because it requires minimal technology but also brings many limitations. When plural component materials are mixed in batches, it creates increased waste that can’t be saved once the paint is cured. This leads to a large amount of unused material, and proper disposal of this material can be expensive. In addition to waste issues, ratio accuracy problems also arise. If the material is not mixed to the proper ratio, the paint might not cure fully or fail to reach the necessary level of performance, thus causing quality defects. Inconsistency between batches due to human error also tends to occur more often than not, resulting in inconsistent finishes on parts. Electronic proportioners provide an automatic way to mix two-component materials on demand. The equipment utilizes meters, dosing valves and electronic closed-loop controls to mix materials to the proper ratio as the product is sprayed. Only what is needed at that moment is mixed, which dramatically cuts down on the wasted material experienced with batch mixing. In addition, colors can be easily changed on the fly, flow rates can be controlled and access to alarms is available for quality control in case issues arise. Electronic 2K systems have a track record for paying for themselves over time due to savings in waste and time. For the highest level of cost reduction and quality control capabilities, look into automating the soft-touch line. Once considered a luxury, paint robots now have significantly dropped in price and are quickly becoming the norm in industrial finishing. These systems best ensure consistent finish on every part, every time. Better consistency also means less wasted material, and automated systems have been shown to reduce material consumption by up to 30 percent. Soft touch has proven to be a rising trend, and the forecasts point to continued success. The differentiating characteristics of this material are making consumers want to reach for it and causing more end users to seek out manufacturers with the capabilities to apply it to their parts. The applications span a wide variety of industries and are only expected to grow. The possibilities are wide open in the expanding soft-touch market. Nick Strauss is a global markets manager responsible for growing and developing the automation market for the Industrial Products Division at Graco. He has been with Graco since 2005, performing in a variety of roles including engineering, operations management, product marketing and business development. Since 1926, Graco Inc. has been a leading provider of premium pumps and spray equipment for fluid handling in the construction, manufacturing, processing and maintenance industries. Headquartered in Minneapolis, Minnesota, Graco works closely with distributors around the world to offer innovative products that set the quality standard for spray finishing, paint circulation, lubrication, sealant and adhesives dispensing, process application and contractor power equipment. For more information, email nstrauss@graco.com or visit www.graco.com/automation.